Explore Japan through content-rich articles introducing big cities to small rural towns and events. The articles are selected by JNTO for the app to enrich your journey. 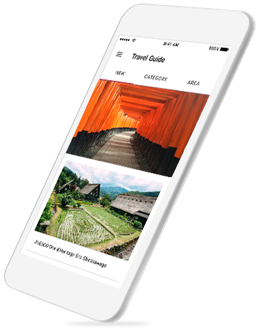 Regularly updated articles and tourist spot information, maps, and route search features help you plan and travel your journey across Japan. Transit search is compatible with Japan Rail Pass. The app contains basic information about Japan that may be helpful for tourists, such as general rules and manners, medical assistance, and embassy contact details. Links to helpful services also provided.